Green is nature's lushest color. It speaks of rolling forests, lawns in the summer and everything we love most about being outside. When we're inside, however, we use green to remind us of everything we left behind when we came in. But green as an interior color isn't just a substitute for the great outdoors. It's a color with tons of character and charm that works well in any capacity in just about any room of the home. We've gathered a few of our favorite rooms for a look at some of the more innovative uses of nature's most ubiquitous shade. In this dining room, a muted green hue adds a sophisticated touch to the space. This unique-looking living area takes an artsy approach to natural tones. Rather than mixing greens and neutrals throughout the space, the room is divided evenly between green and light brown tones. The room is filled with green beneath the midpoint, including the floor and radiator is color blocked in green. At the same time, even the art—a wire-frame stag's headset in an oversized frame—is split along with the rest of the room. Kitchens are usually places for whites and browns, but white and green is so much more interesting. That's especially true in this kitchen which cleverly sandwiches the green center of the room between white ceilings and floors with additional touches of white added in through the sink and other small touches. Green can be a strong color. Too much of it can easily overwhelm the eye and take a living room in the wrong direction. But because of that, we often overlook how soothing and calm a color green can be. This room layers shades of green together, filling the room with color and tranquility. The entryway is the first thing you see when you come home and the last thing you see when you leave. That makes it one of the best places in the home to fill with color. The vibrant, verdant green that fills this entry is sure to make anyone smile coming or going. Green has had its share of turns at the top the trending color wheel. If you're looking to bring a bit of throwback style into your space, using the colors that were big at the time can go a long way to completing the look. In this space, the color combination of green and light wood tones, together with the style of furniture has given this bedroom a definite 70s feel. Plants are always a meaningful addition to the landscape of any room. There's a variety of reasons why it's good for us to keep plants around us, from increased oxygen to many aromatherapy benefits, but on a visual level, it always seems like a room does better with a little bit of green in it. Of course, it can do even more with a lot of green. A light green wall like the one seen in this room is a perfect backdrop to a collection of plants for a color statement that's also therapeutic for your home. Green is often thought of in its stronger, darker tones, but often it's the lighter shades of the color that make the best choice for larger color statements such as painting the walls. This is because in its lighter variations green evokes less of the forest and more of the beach. In this room, the light green feature wall is the major infusion of color in the space, giving it a relaxed and tranquil feel that's the perfect reason to stay in bed. 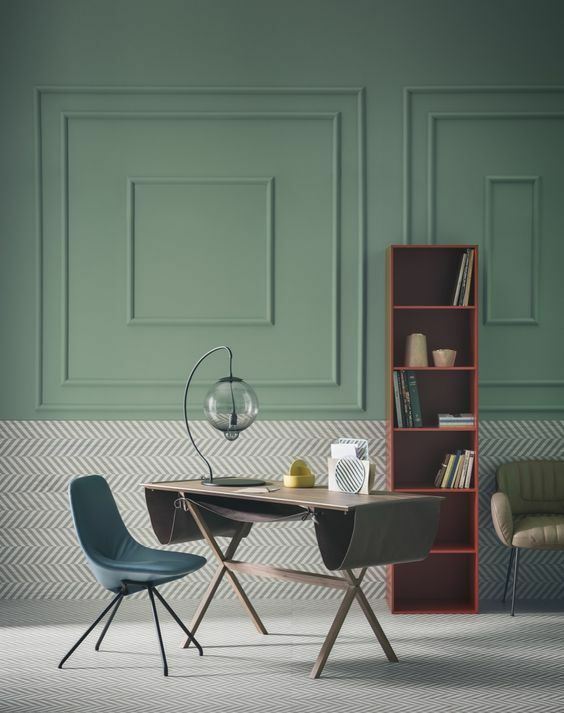 Green is a great highlighting color, a fact which offers a wide array of opportunities for being creative in a room. In this space, the green trim at the bottom of the walls and massive green doors give the room it's the character while the color is picked up and echoed by the many plants in both the stairway and the kitchen beyond the doors. It's no surprise that the bed is the most essential part of the bedroom (the name gives it away). Despite being just one piece of furniture, the bed offers plenty of options for style, one of the best being the headboard. This headboard is upholstered in a rich, dark green that stands out against the lighter colors of the wall. The upholstery continues along the baseboard of the bed as well. Without a doubt, green is an attention getter. But it plays a supporting as well as takes center stage. This kitchen features an island with a surprise. A pop of green on the underside gives the nearly all-white interior a jolt of personality. Even a dark green can pop when paired with an even darker color. That's why green and black have always been such natural color partners. This space demonstrates perfectly how the two blend together. Unlike brighter colors like pink or yellow which also blend well with black, a dark green will stand out without significantly altering the moody feel of the room. When it comes to furniture with a super-modern look, white is often the color of choice. But why not mix things up a bit? The next time you're in the market for a piece of mod furniture, think of this chair and go for a shot of mint green to liven up your space.